Here is a diagram of the new cycling and walking paths the province has proposed for the Stanley Park causeway. 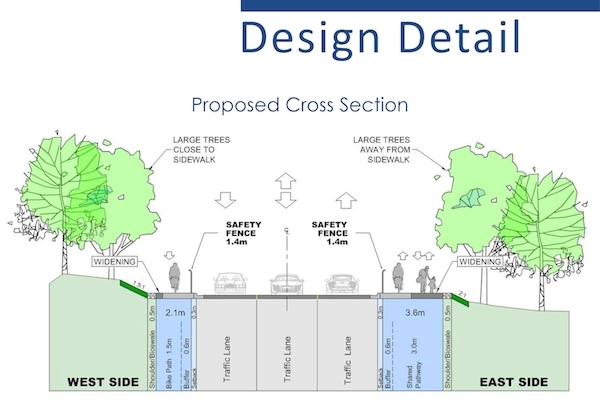 New safety barriers, a divided pedestrian/cycling route on one side and a bikes-only lane on the other side are being proposed as the solution for a dangerous traffic problem on the Stanley Park causeway. But in order to make that work, 14 mature trees along the causeway will need to be removed, according to the provincial transportation ministry. On Tuesday, the ministry took its plan to the public in a one-day open house at Coal Harbour community centre. It has proposed widening the west side of the causeway by less than half a metre. On the east side, it wants to widen the pathway more — a total of 1.6 metres — in order to accommodate both northbound cyclists and pedestrians. On both routes, a post and wire safety barrier would isolate them from the three lanes of vehicular traffic. The suggested option is Victoria’s response to the death of a 61-year-old female cyclist who fell into the path of a bus in May 2013, and to growing concerns about cycling and pedestrian conflicts along the narrow asphalt pathways. The ministry says it has to remove seven mature trees on either side of the road, some of them trees more than a hundred years old. It said it assessed more than 200 trees along the pathways and was able to save all except the 14. But within minutes of the open house entertaining its first visitors, there were disagreements over whether any of the trees need to come down. Some people said the ministry could move parts of the pathways into the forest and around the target trees, while others said no trees should be removed at all, and that cyclists need to slow down and share the paths with pedestrians. The arguments hearken back to a public fight more than a dozen years ago when the province went ahead with a $15-million road-widening project to accommodate the newly refurbished Lions Gate Bridge. In that case nearly three dozen trees were axed, but only after environmental groups opposing the idea lost a court challenge to stop the work. However, the causeway trees are only a tiny fraction of the more than 500,000 trees, mainly western hemlock, western red cedar, Sitka spruce and Douglas fir that comprise the 405-hectare park’s managed forest. A major tree cull along the causeway in the early 1990s removed about 300 unstable or leaning trees. The great storm of 2006 felled about 10,000 trees. About 10 “significant” trees are removed from the park each year as a result of an annual park staff hazard study. More than 15,000 new trees and shrubs were planted as part of the park’s restoration after 41 hectares of forest was levelled by high winds during the 2006 storm. Ashok Bhatti, an assistant district manager with the transportation ministry, said the ministry this time looked at everything from routing parts of the pathways around trees to completely widening both sides. After consulting with public interest groups, including cycling advocates and the Stanley Park Ecology Society, it decided to only widen the west side a small amount. In doing so, fewer trees would be affected, he said. The proposal won cautious initial support from John Coupar, the chairman of the Vancouver park board, who said that it appears to reflect the public’s concerns that tree removal in Stanley Park should be kept to a minimum. Coupar said the park board may request further changes based on public feedback from the open house. Although the road and causeway are the responsibility of the provincial transportation ministry, the park board still has to approve the plan. Bhatti said the ministry expects to reflect public comments in a final proposal it will take to the park board’s elected board in January. If approved, construction would start in the spring, he said. But Wyckham, who described his age as being “more than three-quarters,” still doesn’t like the idea of taking down any trees along the causeway. Jeff Leigh, a member of the HUB Cycling Coalition, said the proposed changes are a compromise for the cycling community. Although the coalition would rather have both sides widened, they understand it would come at the cost of hundreds more trees, particularly on the west side. Patricia Thomson, executive director of the Stanley Park Ecology Society, described the proposed changes as a good start. But she believes fewer trees could still be taken down, particularly on the west side where cyclists coming from the bridge gather speed on the downhill. Bhatti said the public can still file online comments with the ministry for the next couple of weeks. He did not know how much the upgrades would cost.